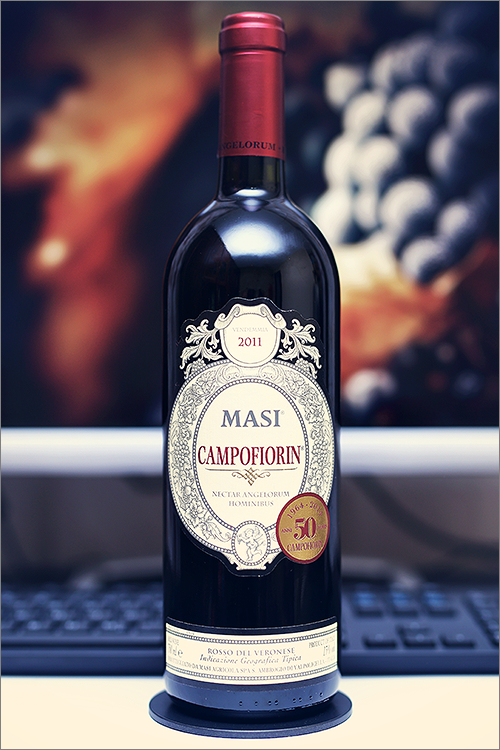 Today we are going to review a wine that is considered a rebel of his generation, un italiano vero, a supervenetian – Campofiorin Rosso del Veronese 2011 from Masi. This is the original supervenetian created by Masi in 1964, the prototype for a new category of wines from the Veneto region, inspired by the famous Amarone production technique, by passing a young and fruity Valpolicella wine over the dried grape skins leftover from the production of Amarone della Valpolicella wine, a process called ‘ripasso’, which kicks off a secondary fermentation, that results in additional concentration and structure in the final wine. This wine is a blend between Valpolicella indigenous grape varieties of corvina, rondinella and molinara and was released in 2014 – fifty years after the original Campofiorin, but enough with the theory, let’s move on to the tasting. Noble garnet color, not too deep nor opaque, with shades of copper towards the rim of the glass. The nose is strong, filled mostly with red fruits: ripe sour cherry, cranberry, sweet cherry, red currant, wildberry, ripe red plum, cherry tree wood, dried oakwood, nutmeg and wolfberry. An instant later the nose is filled with notes of cinnamon, anise, red pepper, cherry seeds, tobacco and some nuanced hints of leather. The wine is medium dry, with moderate alcohol level, high acidity and smooth tannin. It feels round, supple and firm, with a nuanced fruity yet leathery accent. This is a bold, complex and elegant wine, which has a nuanced old-world profile. The wine has a fair overall balance and it feels quite seedy and fine, with a sweet spiciness on the palate. It has a medium finish and a quite balanced, tannic but sweet aftertaste. This is definitely a great Wine of Italy and the overall rating says the same, with 90.7 points scored it is right there, among the best wines we’ve tasted so far. Please click on the chart icon on the left in order to get to the wine rating page, where you can find all the wines we’ve tasted to date. Conclusion: this is a wine over its prime form – fruity, ripe and supple, a wine that display signs of decline, therefore not worth any more bottle ageing. The label on Campofiorin carries the phrase ‘Nectar Angelorum Hominibus‘, which translates into ‘angels’ nectar for humans’, well we couldn’t put it any better, as the wine itself feels noble, elegant and sweet, despite its dryness. For the best experience, we recommend to pair this wine with some honey bourbon steak with grilled mushrooms or some a slow cooked shredded beef ragu pasta, as the later one is a perfect pairing indeed. Salut!